Stafanos Tsitsipas caused the biggest upset yet at this year’s Australian Open by eliminating defending champion Roger Federer in an epic battle on Sunday. The 20-year-old Greek produced the biggest win of his career to oust Federer and reach the quarter-finals for the first time. The youngest player left in the men’s draw downed the oldest 6-7(11), 7-6(3), 7-5, 7-6(5). Tsitsipas edged a tense affair against the 20-time Grand Slam champion, and will face Roberto Bautista Agut for a place in the semi-finals after the Spaniard knocked out last year’s other finalist, Marin Cilic. In a match with spectacular rallies and winners, Federer was left to rue 12 missed break-point opportunities as his forehand let him down time and time again. 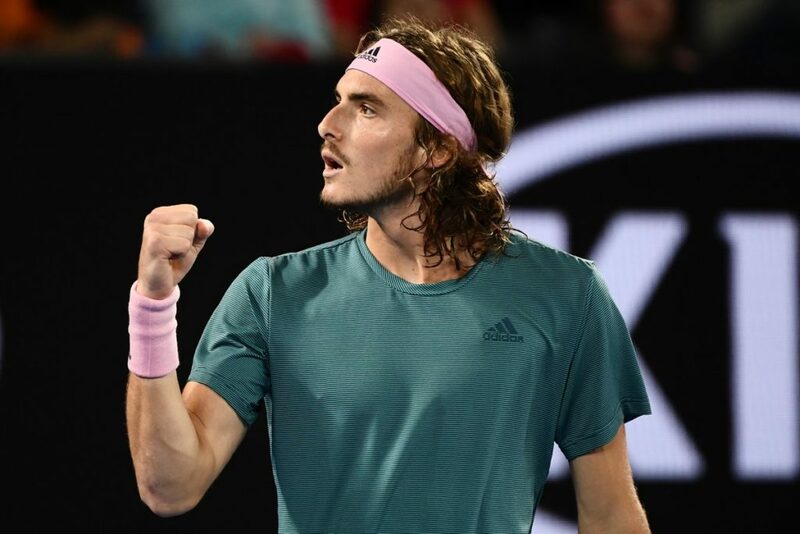 After trading tie-breaks, Tsitsipas claimed the only break of the match in the final game of the third set, before prevailing in a third breaker to clinch a famous win in the Rod Laver Arena in three hours, 45 minutes. ‘I’m the happiest man on earth right now,’ said Tsitsipas, who ended Federer’s bid for a hat-trick of titles and a record seventh men’s singles crown at Melbourne Park. Earlier on Sunday Rafael Nadal was at his brilliant best as he routed former Australian Open semi-finalist Tomas Berdych 6-0, 6-1, 7-6(4) to book his place in the quarter-finals at Melbourne Park for the 11th time. The 2009 champion claimed the first nine games of the match against the world No 57 with a near-flawless first two sets, and while Berdych raised his game to stay with Nadal in the third, he could not halt the Spaniard. Nadal will face unseeded American Frances Tiafoe for a place in the semi-finals. ‘He had one of these days where he wasn’t on his game,’ Nadal said after wrapping up the victory in just two hours and five minutes. ‘I expected in the third set that he would push me, and he had his chances, even had a set point. That was a real set, more than the first two, and I’m very happy to be in the quarter-finals again’. There was something to smile about for the locals as Ashleigh Barty become the first Australian woman in 10 years to reach the quarter-finals at Melbourne Park. She achieved that feat after coming from a set down to defeat Maria Sharapova 4-6, 6-1, 6-4. ‘It’s amazing that it is happening in Australia. I have given myself the opportunity and the chance to play in front of the best crowd in the world on one of the best courts in the world and in my home Slam. There is absolutely nothing better,’ said the 22-year-old after her win. Danielle Rose Collins defeated Angelique Kerber 6-0, 6-2.